of pathogen transmission & translocations (plants & animals) between catchments. 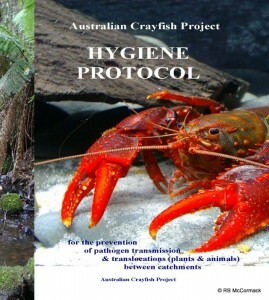 This protocol is for volunteers working in the field on Australian Crayfish research projects. The precautionary procedures listed in the Protocol are designed to reduce the risk of pathogens being transferred between catchments. Pathogens come in all forms and can occur in both freshwater, marine and terrestrial environments, they may be marine diseases like QX disease that affect oysters to freshwater/terrestrial disease like fungus that affects frogs. Regardless of the disease, the protocols listed are designed to reduce the risk of transmission form infected areas to non-infected areas.